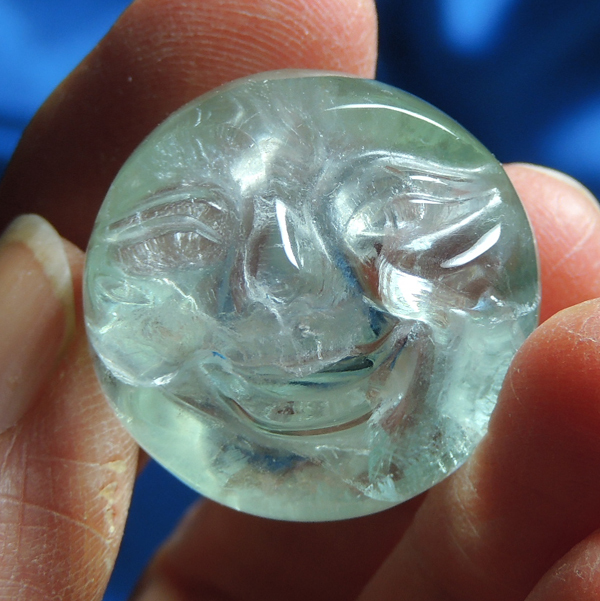 This is a really cute smiling full moon carved from pale green fluorite. She weighs 0.8 oz and measures 1” by 1” by 0.8” and has a flat bottom so that you can place her so that her smile looks up at you. For a special treat, place her under a UV light and she turns into a neon blue moon! She also has a very shy rainbow and her pictures just plain do not do her justice! I took her in on a trade and I wish she was meant to stay with me but she is meant for another. She is a wonderful Spirit for Reiki or crystal healing … and perfect for a medicine pouch too! Fluorites allow you to put physical, emotional, intellectual and ethereal Chakras into alignment and balance, in effect, organizing your energy levels. Green fluorite has a very special role in that it just pushes negativity away. This Spirit is incredible placed in a room (or taken in within the security of your pocket) where there will be others, to soothe, calm and energize the surroundings. She raises the room’s vibration and instills a state of Light and Love. Generally speaking, I don’t think of fluorite as a heart stone, but when you work with this one, play an Italian opera, burn your favorite incense and prepare for an opening that will flood your Self with emotion, release and healing all at once.